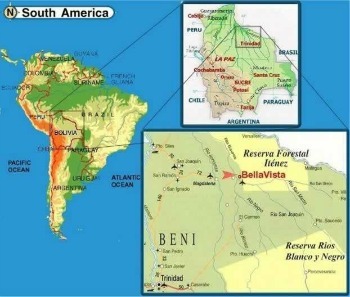 Bella Vista village is located in the department of Beni, Iténez Province in the northwest of Bolivia, and covers 213,564 km. At 20:00 hours we pick you up from your hotel to take you the Bus Terminal (Bi-Modal) in the City of Santa Cruz. At approximately 06:00 next day the bus it is planned to Arrive at the bus terminal of Trinidad city. Transfer from the bus terminal of Trinidad to main plaza for some breakfast and bathrooms. After about 1 hour we head towards the place where the public vehicles start the trip to San Ramon and Magdalena. Towns along the way to Bella Vista. The first part of this trip will take about 3 ½ hours until San Ramon. All the trip of today is on a off road with the exception of a few kilometers after Trinidad city. This road has been raised above the level of the flat low lands all around. Also we will have real chances of wildlife observation, like Capibaras ( Hydrochoerus hydrouchaeris ) Yacares among others animals. Lunch is programed in the village of San Ramon or Magdalena, typical little towns with very kind native inhabitants of these hot and flat lands in the north of Bolivia. During rain season almost all the highway that start in Trinidad is under water. Nowadays the local government of Trinidad is working to make it about 80 centimeters higher. During the dry season this road is very dusty. After Crossing two rivers; Xiama River and Rio Blanco, on a flat boat and about 7 hours of traveling we get to Bella Vista Village. After a warm welcome at El Tucunare lodge we set up in ours rooms. After breakfast, we go on small engine boat towards Rio Blanco hoping to see some pink dolphins and many birds. If the visitors want to do some sport fishing it is possible to do it. In the area you can find; Surubis, General and many others. This tour can take about 2 or 3 hours. It will depends on how it is scheduled. In the afternoon hours we take a short brake in the rooms of El Tucunare or in the hammocks of its restaurant, while the day cool down a bit. When you are back in the lodge a great dinner will be waiting for you. This day we will go on San Marin River or some of its many oxbow lakes. Also today we can program a short walk to a hill to have the chance of a view the landscape with the river, lakes and its natural pampas. Which is the typical landscape of El Beni. In the afternoon hours some walking aroung the village is possible to know a few things more about the activities of its inhabitants and about this part of Bolivia. Bella Vista is a Village located inside of a regional nature reserve called Itenez. At about 17:00 we take another tour in the boat. This time we will stay until night for a few hours in a small stream with flashlights and on a paddle boat trying to see caimans or others animals. After breakfast we say good bye to the people of El Tucunare and to Bella Vista. Then we start our trip back to the city of Trinidad. We will be arriving at Trinidad about 17:00 hours. At approximately 06:00 next day the bus is planned to Arrive at the bus terminal of the Trinidad city. On the road we will have real chances of wildlife observation, like Capibara families Hydrochoerus hydrouchaeris ) Yacares among others animals. We are supposed to be at Bella Vista about 17:00 hours. 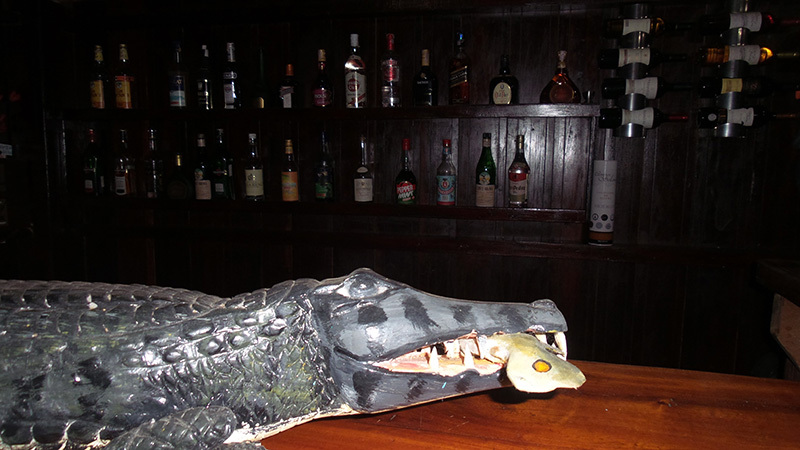 After a warm welcome at El Tucunare lodge we set up in ours rooms. After breakfast, we go on small engine boat towards Rio Blanco. During this first ride on rio Blanco we will try to see some pink dolphins and birds. Once in the city we go to a restaurant to have dinner and about 20:00 hours take a taxi to go to the bus terminal. At about 21:00 hours we board the bus with destination to the city of Santa Cruz. We may be getting at the city of Santa Cruz at 06:00 in the morning. The service of public bus usually is with a cold air conditioned , so please take with you yur sleeping bag. Bella Vista Tucunare lodge is located in the department of Beni, Iténez Province in the northwest of Bolivia, and covers 213,564 km². 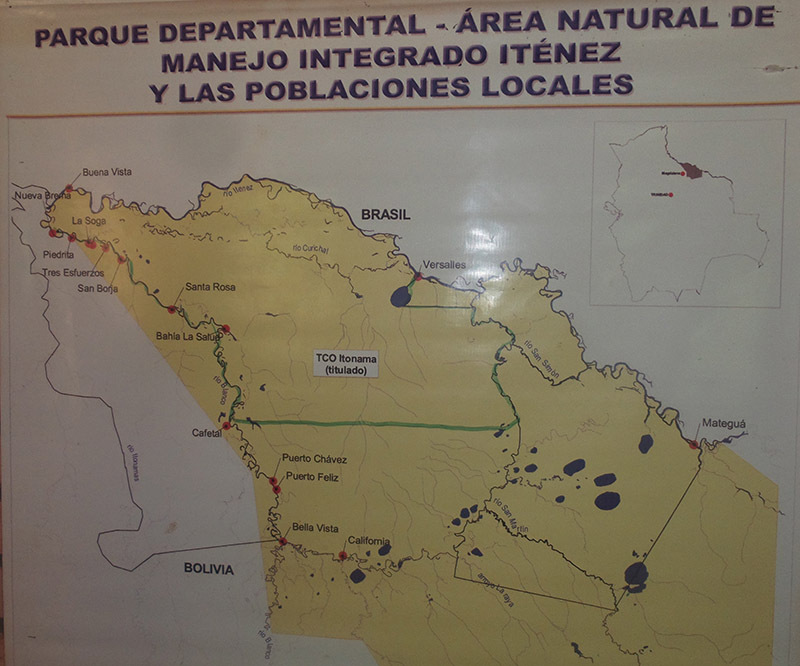 The region of El Beni shares its borders with Pando to the north, Brazil to the east, the Mosetenes and Marimonos mountains to the south, the department of Santa Cruz to the southeast and the department of La Paz to the west. This area has the purest air in the world according to many specialists in climatological and ecologic sciences. An example, the tajibo tree is responsible for most of the oxygen generation in the world. Claude and Martha invite you to one week of adventure in the heart of the Amazon rain forest. Discover below the activities that we can propose you during your stay. 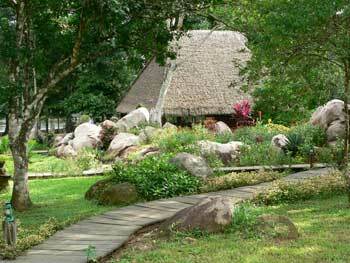 Upon your arrival at the Bella Vista airstrip you will be met by local people playing their traditional music. A taxi will be waiting to whisk you to our resort where you will be welcomed with a cocktail. Wake up at 4:30am with a cup of coffee for breakfast. 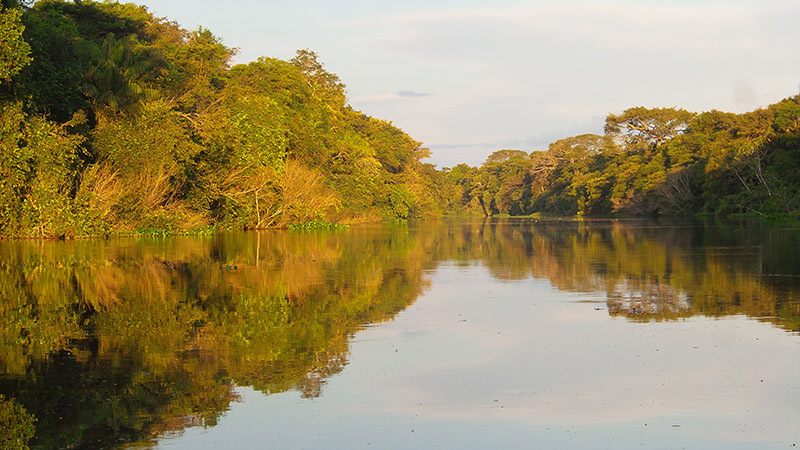 We take a boat that will lead us to San Martín river, where we will discover the rainforest and river dawn. Birds and animals welcome you with a wonderful dawn chorus. After one and a half hours navigating the river, we come to a small community in the heart of Amazon - “California ". There we will have breakfast, and continue our journey towards the golden hill “Orícore ". For about 20 minutes we will climb a higher hill, to take in the panoramic view. Then return to our facilities at lunch time. 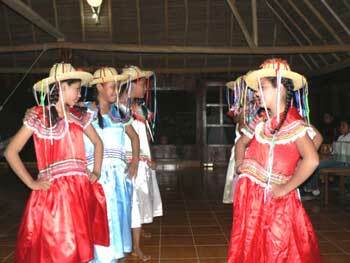 After dinner, a folkloric group will visit us, so we can enjoy the dances and the songs of the people from Bellavista. The guides, will take you by footpath to the hills, where we will discover a great variety of trees and vegetation. Here we can lasted plants with medicinal properties. But don't worry if we are thirsty, we can enjoy the water contained in "palo de agua" (a vine that contains potable water) that has the peculiar virtue of preventing or curing prostate cancer. We can also take a look at the "palmito ", whose hearts make a delicious salad. 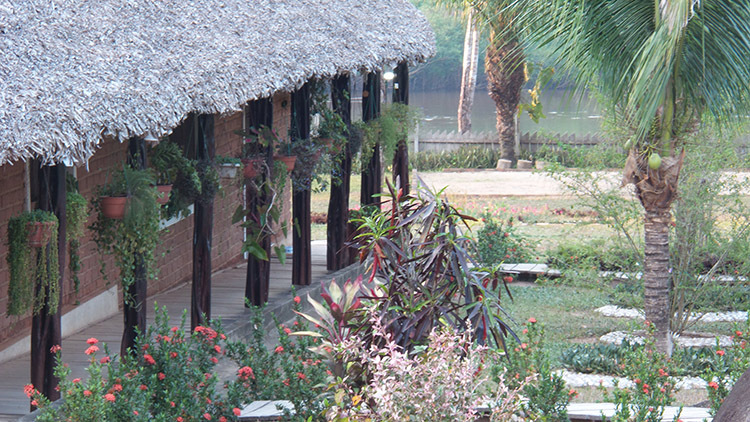 We will visit the town and be able to enjoy the pretty riversides around Bellavista. From june to december. We start sailing the Baure River. According to the level of the water, we will be able to enter a called stream “Trinidadcito ", where we can Lastd a lot of piranhas, crocodiles and londras. If the level of the water is very low, we head to the border of the river and thus we have the possibility to take good photos of various animals and fish. By the evening, we have a trek that lasts three hours to the mount. There you will discover the wonders that the nature presents to us, listening to the sounds of the Amazon and taking photos. 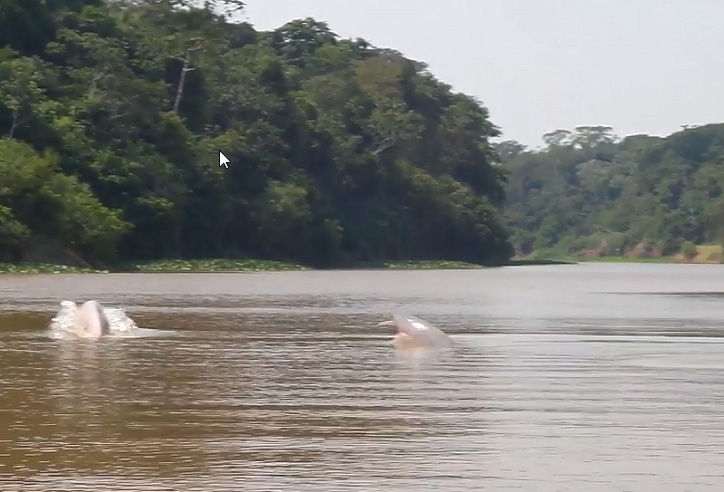 In the Baure River, near the village we will take a walk to see the pink and blue river dolphins. Carrying on up the river we will go to the Salitral and into the forest to a small lagoon; home to many animals and giant trees. After crossing the San Martín river on horseback we shall go for an hour and a half through the pampas to an island where there is a troupe of monkeys, flocks of parrots, wild turkeys, small deer, etc. 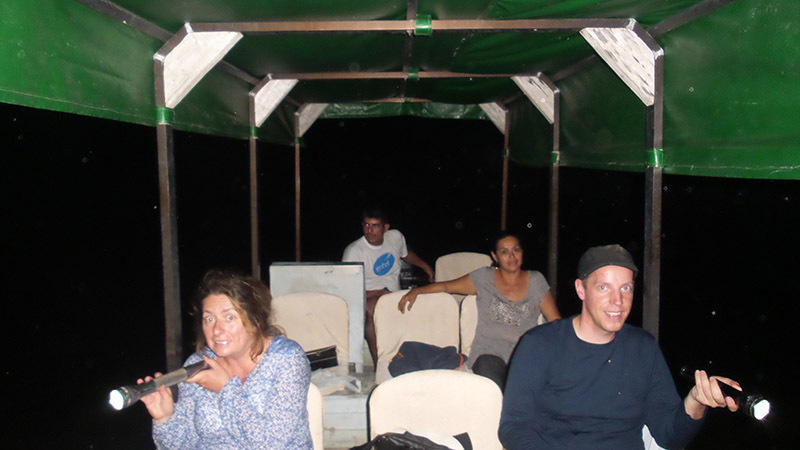 After an hour by boat, at nightfall, we come to the rocks of Verdún to listen to the sounds of the large fish in search of food, the crocodiles and the river dolphins. In the jungle by the side of the river you can hear birds singing, and at night, the growling of a jaguar. Guaranteed to get your heartbeat going! A local group will come to entertain you with traditional music, dancing and song and the dancers from the village will show off their beautiful typical dress. Here you can relax on the beach next to the River Baures and watch the local people swimming, fishing, playing and bartering their produce. 20 minutes upriver we enter the forest to reach a lagoon 100 meters from the riverside. 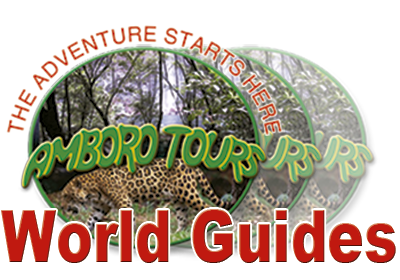 We will be able to see crocodiles, capybaras and different varieties of birds. The fishing is good but difficult here but we can catch tucunares, piranhas, bentones and surubies. In the lagoon outlet we can fish for curubinas, piranhas and palometas. And then have a feast for lunch! Some activities are better at certain times of the year as much depends on the height of the river. From December to April the water can rise up to 7 metres and begin to recede in May. The forests contain trees of all types, such as: Itahuba, Caricari, Tajibos, Cedar, rust-coloured Cuta, Almandrillo and others. 50% of the woods are exotic. Medicinal plants exist and are used to cure ailments such as: ulcers, asthma, blood disorders, appendicitis, cardiac diseases, respiratory problems, snake bites, digestive problems and others. Wild flowers of incredible beauty and colors can be found throughout the zone, from the rivers to the forest. The fauna makes up 80% of the diversity in the world according to some scientists. A total of 643 species has been identified each with a family of their own: 326 birds, 185 fish, 67 mammals, 37 amphibians and 28 reptiles.